The 937th report on the crisis of democracy in the Trump era was released Tuesday. Half of Americans polled believe that the U.S. is in “real danger of becoming a nondemocratic, authoritarian country” and two-thirds believe democracy is “getting weaker,” according to the study. This report is a co-production of the George W. Bush Institute, the University of Pennsylvania’s Biden Center, and Freedom House, partnering to create the Democracy Project. A quick search reveals that the word “tainted” is nowhere in the report. 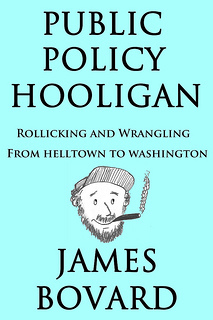 But the list of authors effectively assures that the report will overlook how the abuses of recent presidencies sabotaged Americans’ faith in their political system. The report asked Americans to specify their concerns from “a list of some things that some people might say are wrong with our democracy.” Big surprise for a report tied to political poohbahs: “political treachery” is not on the list of 11 problems of democracy. Instead, people could complain about issues like “big money in politics” or “racism and discrimination.” People did have the option of checking “government getting too big and intrusive” (mentioned by 16 percent of respondents) but the wording suggests that is something which simply happened, like moss growing on the north side of rocks. 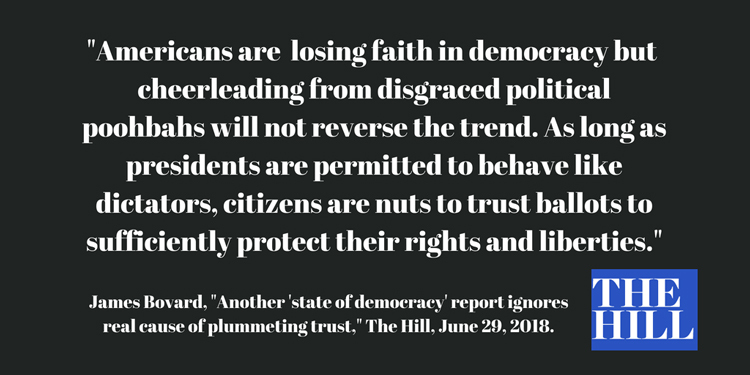 Former President George W. Bush declared that he hoped the report and its recommendations “can be a step toward restoring faith in democracy and democratic institutions.” But rolling out George W. Bush to whoop up democracy is a mistake. Why would anyone trust George Bush’s advice on any subject aside from how to get rich from eminent domain abuses connected to professional baseball team stadiums? Bush relied on false pretenses to drag the nation into war against Iraq, a conflict that left 4,400 Americans and hundreds of thousands of Iraqis dead. As president, Bush lied about ordering torture and then boasted about it after leaving office in his memoir. Bush’s White House counsel Alberto Gonzalez argued a “commander-in-chief” override entitled the president to violate federal law. The report quotes former Vice President Joe Biden: “The United States is unique among nations because we are founded on a set of democratic ideals” and “a commitment to certain basic rights and fundamental freedoms.” Regrettably, that lore was apparently non-binding in the Obama era. The Obama administration approved massive illegal surveillance on Americans and concocted an array of new prerogatives including a presidential right to assassinate Americans who were suspected of terrorist associations. The report tested various pro-democracy messages and found that the one that “generated the most favorable feelings about America’s system of democratic government used the phrase ‘so that the freedoms and rights we cherish don’t get whittled away.’” If this is their ace, then the report should have recommended prohibiting teaching American history. Americans’ faith in democracy and politicians has plummeted in large part due to perennial violations of their rights by one federal alphabet agency after another, from the FBI, to the TSA, to the DEA, to the DHS, and to the IRS. Candidate Donald Trump periodically signaled that he would curb federal abuses but, as president, he has instead spurred new crackdowns on drug users, property owners, immigrants, trade, and other targets. Americans are indeed losing faith in democracy but more cheerleading from the political ruling class will not reverse the trend. As long as presidents are permitted to routinely behave like dictators, citizens would be foolish to trust ballots to provide all the protection their rights and liberties need or deserve. Americans should scoff at any democratic faith-building exercises that omit government under the law and the Constitution.